Yeah, but: I shouldn't like it this much. The Long Version: Only one layer thicker than February's SAK Of The Month, the Bantam, the Victorinox 'Compact' adds a lot of options over the slimmer knife. Like the Bantam, there's a large blade and combo tool taking up one layer, while the Compact includes a second tool layer that has a pair of scissors. 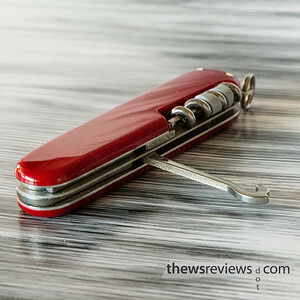 That alone doesn't make much of a difference, even though the Victorinox scissors are quite good, but the Compact also adds back-side tools and the 'plus' Cellidor scales. My favourite back-side tools are the awl and the Philips screwdriver; I avoided the Compact for months because it has neither, but it has turned out to be one of my favourite knives anyway. I would only use the backside awl for starting screw holes – unlike the inline awl of January's SAKOTM, the Electrician, which can work as a cutting tool – and the corkscrew actually does that pretty well, in addition to all of the other cork-screwy functions that the awl can't do. While the backside Hook tool is a fairly low-demand item, to be polite, the Compact adds a narrow nail file to the exposed surface of it. This creates a workable substitute for the typical nail file tool, which would otherwise need the spot that the combo tool takes up in the Compact. And let me tell you, I love the combo tool – it replaces the screwdriver, can opener, and the backside Philips driver all at the same time. So anything that lets me have the combo tool is a win, and on the Compact there isn't a single downside to having it on the knife. Okay, I do sometimes wish I had a small second blade, but I can live without it when I need to. This is something of an 'unofficial' use for the combo tool, as Victorinox doesn't seem to know about it, but the acute corner makes an excellent Philips screwdriver. No, I wouldn't want to hang a sheet of drywall with it, or use it for any real work, but that's true for the backside Philips as well. All I'd really use either for is loosening a screw before removing it by hand, or other occasional light tweaks, quick tasks, or desert-island emergencies. The rare inline Philips can be genuinely useful, but using the combo tool instead of the backside Philips isn't giving up much. Hidden in the 'plus' scales is a small pin (look in the corkscrew cutout) and a slim pen, which join the traditional tweezers and toothpick of the standard Cellidor-scaled knives. 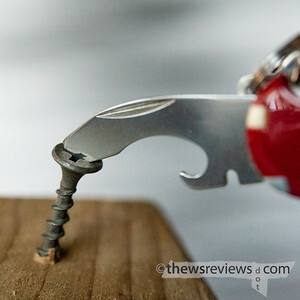 I can't quite say that I've never used these two additions – I tried using the pin for something, which didn't work, but the tiny-slot eyeglass screwdriver that fits into the Victorinox corkscrew did the trick instead. It's tough to find a SAK-appropriate task that the Compact can't do, despite it only being a two-layer knife. In terms of actual functions, rather than just tool counts, it compares quite favourably to much thicker knives. I generally choose an unreviewed SAK for daily carry each month, but I think the Compact may continue to ride shotgun for quite some time. I've got this tool, and it's actually my favorite model so far. I had the Huntsman before (4 layers I think?) but it was too bulky to be carried daily. The Compact really lives up to it's name. I use every tool on it, and actually prefer the combo tool vs the full size can opener. The pen is a nice touch, and I added a mini screwdriver that is held by the corkscrew when not in use (not really recommended unless you need one, for eyeglasses or maybe watch bracelets). One thing I've noticed about Swiss army knives is that a tool's usefulness is often dictated by the owner's needs. I don't use a lot of the extra tools in larger models, so finding the compact was like a "eureka" moment. It has all of the things I use on a regular basis, without any of the added bulk from unused extras. I would like to try out a 3 layer model though.. I'm planning on reviewing a 4-layer knife next month, but I have to confess that I'm having trouble convincing myself to carry it. It's too thick for easy pocket carry, and it really doesn't add much that the Compact can't do. Your comment made me realize that I don't own any three-layer knives, which seems like a fairly major oversight. There may be a Mechanic in my future, or perhaps one of the Alox models that adds a saw, assuming that I'm willing to carry it.